This is a limited edition 7" record (300 copies only) that was released to be sold on the European tour of On Trial and Josiah. It features the track "O.B.N" from the bands latest effort, Into The Outside. In addition, you get three tracks from a BBC session recorded in May 2004. The highlight is the live version of "Malpaso". Worth the money alone! Cool. Boring artwork though. 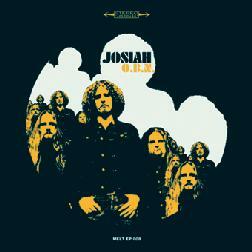 For more information you can visit the Josiah web site at: http://www.josiahrock.co.uk.